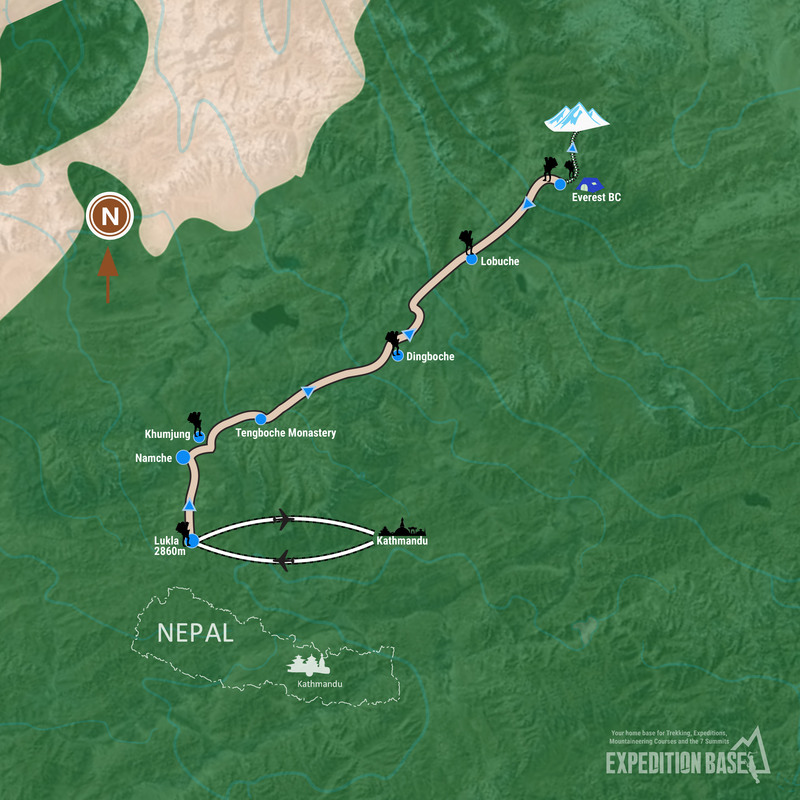 Join Expedition Base’s expedition to Mt Everest and by doing so, you will give yourself a great opportunity for success in reaching the top of the world’s highest mountain. The ultimate dream of many mountaineers is to one day take on one of the biggest mountaineering challenges possible – to climb Mt Everest – so why not climb it with one of the premier teams in the industry, Expedition Base. Turning the dream into reality requires a lot of hard work. Expedition Base will accept clients who have the requisite skills and level of experience to attempt to climb this honourable mountain. Start planning early. Prepare early and partner with us so that we can help you get into a position where you have the best chance of success and to ensure that your investment is well made. This mountain deserves your best effort and, with that, you put yourself in the best position to succeed. The structure of the Expedition Base expedition to Mt Everest is to put you in the best position for success. Expedition Base is all about safety first, fun and wonderful experiences. It’s not about cost, nor cutting corners nor putting yourself and team members at undue risk. This expedition has its risks so Expedition Base will work with you to help to prepare you for the best experience possible and minimise the risks that may arise in a mission of this kind. With Expedition Base you will tackle Mt Everest via the South Col and South East ridge route, the same route taken for the first successful summit of Mt Everest in 1953. 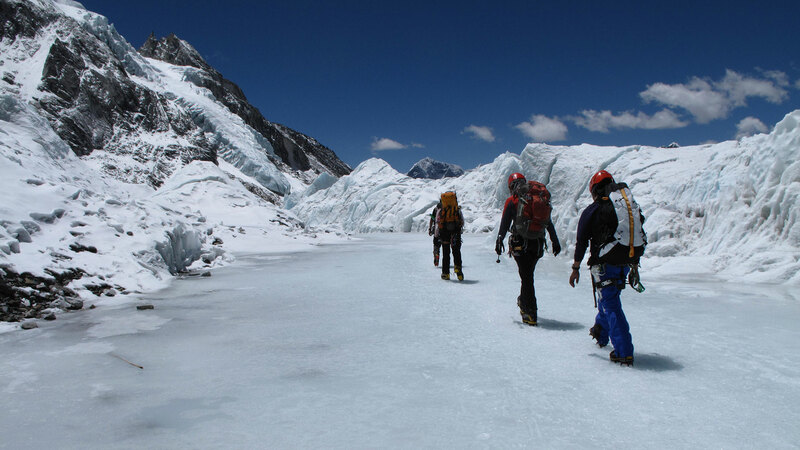 You will pass through and across such infamous features as the Khumbhu Icefall, the Western Cwm, the Yellow Band and the Geneva Spur. Once you're on the summit push, you will look back in awe towards Makalu, Lhotse, and when you are standing on the South Summit – which stands at 90m vertical below the true summit – you will see across towards the Hillary Step and the true summit, and know that your dream is within reach. 5 nights hotel accommodation in Kathmandu eg. Hotel Radisson or Hotel Tibet, Lazimpat (or similar), airport transfers to hotel (and back to airport), welcome team dinner, all necessary climbing and trekking permits, team transport in Kathmandu, experienced expedition leader, government liaison officer fee, fixed wing flights to and from Lukla, all meals and accommodation during trek to base camp and return, porter service to carry up to 60kg personal gear to base camp, fully serviced powered basecamp (including personal tent, heated dining tent and communication tent, full satellite communication system (pay per use), all meals/snacks and hot showers), 2-way radio system for guides to communicate between camps, team of climbing guides to set up and stock higher camps, climbing guides to assist to carry personal gear to higher camps, all meals and tents above base camp, 1:1 guide: client ratio on summit day, high O2 allowance with quality delivery system, high altitude wilderness first aid kit, transport of group equipment to base camp, all group climbing equipment supplied, all other charges for route setting and two complimentary expedition duffels for client to use and keep.